Use the patterns to hold your eggs or place the designs inside plastic eggs. Multiple ways to use them are listed below. Optional: Color and cut out the egg shapes. Place each egg-shaped picture inside a plastic egg and number the plastic egg to match the number on the picture. Hide these special eggs together with candy-filled eggs. 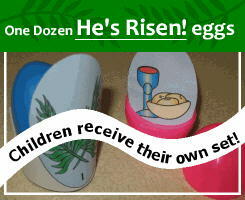 Once all the eggs are found have the children open the numbered eggs in sequence to tell the Easter story. Variation: (Use one set of pictures per 12 or less children) Cut out the egg shapes, but DO NOT color them. Place the uncolored pictures into plastic eggs and hide them together with candy-filled eggs. Once the children find the eggs have them color the pictures. (If one child finds more pictures, evenly divide them amongst the children.) 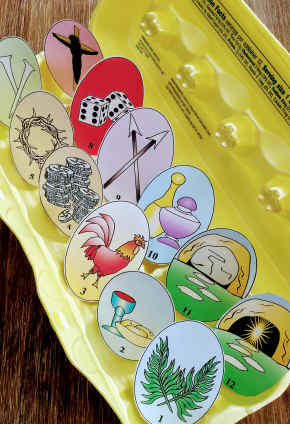 When the twelve pictures are colored, tell the Easter story using a child-friendly Bible and the egg pictures. # 1) Palm Branches - (Palm Sunday) Jesus was hailed as King (Matthew 21:1-9, Mark 11: 1-9, Luke 19:28-38, John 12:12-19). 1) Make a mobile using the egg pictures. A great family project during Holy Week! 2) Napkin rings for your Easter dinner table. 3) Name place holders for your Easter dinner table. Here's what you do: Copy and paste the patterns to a Paint or graphics program to color them or color by hand. Write your guests' names on the front of the eggs and the item and Bible verses on the back. Before or after dinner have your guests take turns in sequence to name their egg and read the Bible verses. If you have more than 12 guests, print more than one set and allow more than one person to read for each item. 4) Play Resurrection Egg Pass. Teams compete by passing their special eggs on spoons, then open them to tell the Easter story. 5) Center Piece for your Easter dinner table. Place hard-boiled colored eggs into the egg holders and arrange them around a decorative centerpiece. Have the kids color and cut them out while you prepare Easter dinner! 6) He's Risen Egg cookies using edible paper and ink*. You'll need to copy and paste the egg pictures to a paint or graphics program to color them, then print them out using the special edible paper and ink. Bake and frost 12 sugar cookies then cut out and apply the egg pictures on top. Eat and enjoy! Click here to learn more about edible paper and ink. * DO NOT TRY THIS WITH REGULAR INK AND PAPER!